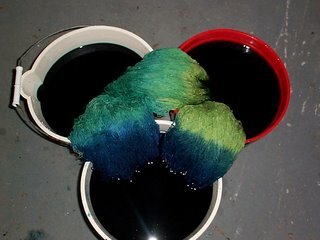 As promised, here are some pictures from the cotton dyeing I did yesterday. Actually, one yarn was 100% cotton and the other was a cotton/rayon blend. Rayon is a vegetable fiber so the cotton dyes work on it just fine. Cotton is different to dye than wool. You use different dyes and you don’t have to steam it. You just soak it in the dye and then rinse it. 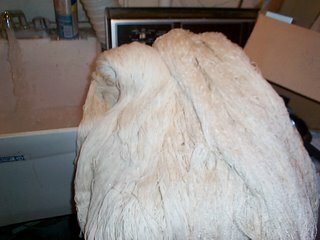 You have to rinse it a lot more than wool too. It can be a lot like doing laundry by hand. Included in here is another Hall of Shame UFO. Last year, my friend Jessica, a Reiki Master, let me take a weekend class of hers for free in return for a sweater. Yesterday, I finally (FINALLY!) dyed the yarn for it. I’m going out to see her in California the first week of July and my goal is to be knitting her sweater on the plane. 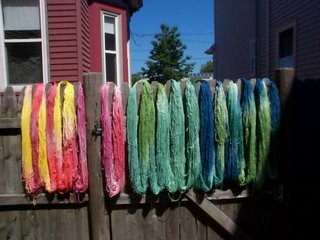 Here is how her yarn looked in the buckets. I love how the colors mix where the yarn goes from one bucket to the next! You have to be fairly organized with cotton dyeing since you can only do as many colors as you have buckets. I wasn’t all that organized yesterday so I had to do the dyeing in two batches. That and I can’t seem to find all my buckets! I used to have at least nine buckets and I was only able to find four of them. I have a funny feeling that at least a few of them are upstairs in my mother’s apartment (which will be thoroughly searched in the near future!). 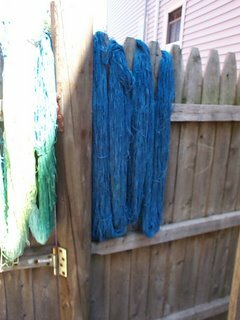 Anyway, here’s the finished yarn drying on the back fence. The blues and greens were the first batch and the oranges and yellows were the second batch. Everything is going to get listed on Etsy today except the blue-green variegated (top picture, left side) which if for Jess’ sweater. I’m going to start knitting that tomorrow (or whenever the yarn dries!). If the cottons start selling on Etsy and in the shop, I’ll definitely be dyeing more. Your hand died looks so very yummy. It is making me salivate. Or perhaps it's time for dinner. Either way BRAVO!! and God save the Queen of the Buckets!!! !